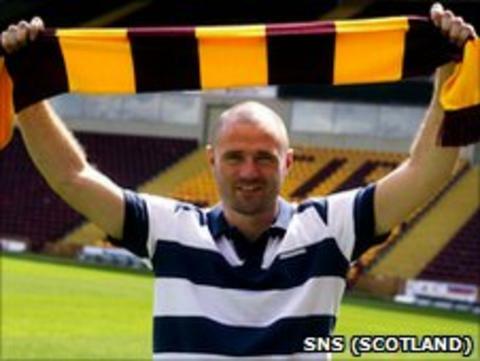 Motherwell have completed the signing of former St Mirren striker Michael Higdon on a free transfer. Higdon, 27, had a spell with Falkirk before joining the Saints in 2009, scoring 15 goals last season. "The opportunity to work with Stuart McCall was a big attraction, the club certainly seem to be heading in the right direction," Higdon said. Motherwell boss McCall said: "His SPL record last year was 14 goals in 29 games - terrific in anyone's language." With the departure of John Sutton to Hearts, McCall made signing the out-of-contract Higdon his top priority. "When I was made aware that Michael didn't want to go back down south, which was first reported, he was our number one striking target," he said. "If you look at the way the game is played in Scotland, you need a physical presence. And, allied with his goal scoring record, we are hoping he will be a good signing for Motherwell." "Hopefully with the way we play, with two wide men, we can create opportunities and Michael can take them." Higdon is excited by his move to Fir Park and is eagerly anticipating the start of the new season. "I am really pleased to be here and I can't wait to get going. "Last season went very well for me; it was just unfortunate it had to end when it did because when you are scoring goals, you just want the games to keep coming," the Liverpudlian commented. "It was hard to leave St Mirren as I really enjoyed my time there; they are a good club and I wish them all the best for the future."